President Nixon, though possessing the instincts and speaking the increasingly conservative language of the mainstream Republican Party all his life (his writings on domestic policy attest to this,) governed within the boundaries set by the New Deal. Where other conservatives like Barry Goldwater had no interest in “streamlining government,” “making it more efficient,” and “promoting welfare,” Nixon sought to do exactly these things. He might be considered a “good-government conservative,” seeking, as did his mentor Eisenhower, to make the institutions of the New Deal state work more effectively and efficiently for the American people. At the time, liberal Democrats had no interest in reforming governance in this way, while more conservative Republicans offered no solutions but “starve-the-beast.” Nixon was pioneering a pragmatic middle ground. If there was a single animating principle behind Nixon’s good-government reform efforts, it was this: lessen the power of the federal bureaucracy. There were various ways Nixon went about this, but this article will examine three. Nixon would empower the poor and those dependent on federal aid by replacing strings-attached welfare and social programs with no-strings-attached payments, believing poor people would be better at deciding how to spend their money than bureaucrats. Nixon would empower officials (and bureaucrats) at the state, city, and county levels by passing revenue sharing aid along to them. Finally, Nixon would oversee the smoother management of the federal government, by reorganizing the federal departments into departments based on broad purpose and function rather than on sector or constituency. But these bold good-government reforms are worth revisiting today, if only to gain insight into the unique governing philosophy of President Nixon. Daniel Patrick Moynihan, head of Nixon’s Urban Affairs Council, strongly advocated for what he called the “income strategy-“ a resolution to fight poverty by boosting incomes and putting money in poor people’s pockets, rather than providing social services staffed by career bureaucrats. After much internal jockeying over such issues as the enforcement of work requirements and rates of support payments, the “Family Assistance Plan” became the administration’s keystone domestic policy initiative, the vital core of its New Federalism. … I, therefore, propose that we will abolish the present welfare system and that we adopt in its place a new family assistance system. Initially, this new system will cost more than welfare. But, unlike welfare, it is designed to correct the condition it deals with and, thus, to lessen the long-range burden and cost.…The new family assistance system I propose in its place rests essentially on these three principles: equality of treatment across the Nation, a work requirement, and a work incentive. The FAP would have been the most significant reform in American social welfare policy since the 1930s and one of the most transformative domestic policies of the latter half of the 20th Century. It would have served the administration’s goal of weakening the bureaucracy by reducing the responsibilities of federal service agencies, opting instead for a cash handouts approach that incentivized job attainment. Ultimately, due to lengthy conflicts over the substance of welfare reform between the Moynihan and Burns camps, the administration never put forth a bulletproof proposal to Congress, and Congressional conservatives and liberals united to defeat what they respectively regarded as too generous and too stingy a proposal. There is too much to be done in America today for the Federal Government to try to do it all. When we divide up decision-making, then each decision can be made at the place where it has the best chance of being decided in the best way. When we give more people the power to decide, then each decision will receive greater time and attention. This also means that Federal officials will have a greater opportunity to focus on those matters which ought to be handled at the Federal level. Strengthening the States and localities will make our system more diversified and more flexible. Once again these units will be able to serve–as they so often did in the 19th century and during the Progressive Era–as laboratories for modern government. Here ideas can be tested more easily than they can on a national scale. Here the results can be assessed, the failures repaired, the successes proven and publicized. Revitalized State and local governments will be able to tap a variety of energies and express a variety of values. Learning from one another and even competing with one another, they will help us develop better ways of governing. The ability of every individual to feel a sense of participation in government will also increase as State and local power increases. As more decisions are made at the scene of the action, more of our citizens can have a piece of the action. As we multiply the centers of effective power in this country, we will also multiply the opportunity for every individual to make his own mark on the events of his time. Finally, let us remember this central point: the purpose of revenue sharing is not to prevent action but rather to promote action. It is not a means of fighting power but a means of focusing power. Our ultimate goal must always be to locate power at that place–public or private-Federal or local–where it can be used most responsibly and most responsively, with the greatest efficiency and with the greatest effectiveness. Integral to the Revenue Sharing programs, and indeed to the New Federalism as a whole, was the urge to, as Richard P. Nathan put it, “sort out and rearrange responsibilities among the various types and levels of government in American federalism.” With the complex ecosystem of American federalism approaching incomprehensibility, Nixon’s administration sought to rationalize it somewhat by decentralizing some functions and centralizing others. Nathan argues that inherently trans-regional issues, such as air and water quality or basic minimum welfare standards, were best managed at the federal level, as were basic income transfer payments. Meanwhile, more complex and regionally variant issues, such as social services and healthcare and education, might be better dealt with locally. Many of the functions of powerful federal departments would thereby increasingly be taken up by states and cities, which would now have the federal funding to manage things they once could not. In this way, Nixon weakened the federal bureaucracy by empowering political entities far away from the national bureaucracy’s central core in Washington. Revenue Sharing of all sorts was broadly popular across party lines, but was terminated by the middle of the Reagan Administration. The third significant aspect of President Nixon’s domestic agenda was the wholesale reorganization of the Executive Branch’s departments. The twelve departments existing at the time of Nixon’s presidency had all been born out of necessity over the first two centuries of American history, and typically corresponded to particular economic or infrastructural sectors (for example, the Department of Agriculture.) New agencies proliferated within the departments, and often times different departments would pass conflicting regulations on the same subjects, making a tangled environment for citizens navigating through the mess. We must rebuild the executive branch according to a new understanding of how government can best be organized to perform effectively. The key to that new understanding is the concept that the executive branch of the government should be organized around basic goals. Instead of grouping activities by narrow subjects or by limited constituencies, we should organize them around the great purposes of government in modern society. For only when a department is set up to achieve a given set of purposes, can we effectively hold that department accountable for achieving them. Only when the responsibility for realizing basic objectives is clearly focused in a specific governmental unit, can we reasonably hope that those objectives will be realized. When government is organized by goals, then we can fairly expect that it will pay more attention to results and less attention to procedures. Then the success of government will at last be clearly linked to the things that happen in society rather than the things that happen in government. 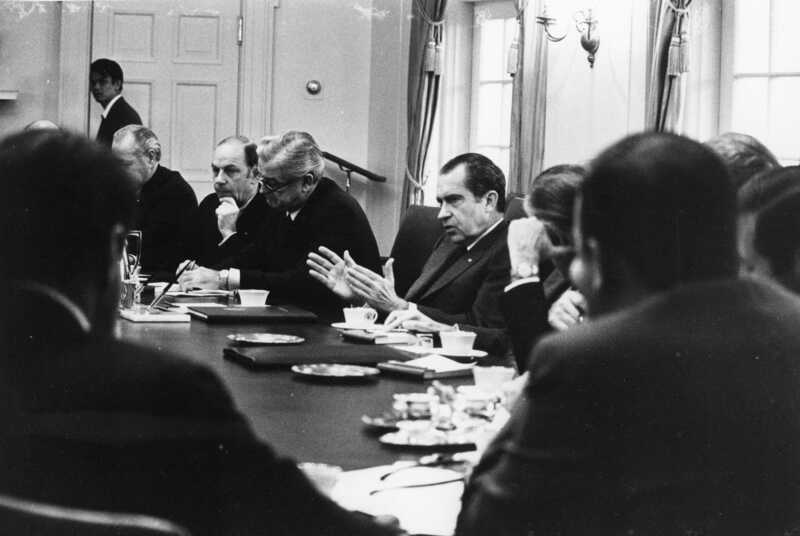 Rather than being a conscious component of the New Federalism, the Executive Reorganization is more rightly thought of as a part of what Richard P. Nathan calls the “Administrative Presidency-“ Nixon’s attempts after 1972 to bring the federal bureaucracy much more directly under his personal control, through reorganizing the Executive Branch and through appointing personal loyalists to Cabinet positions and other spots. This, of course, would have lessened the influence of career bureaucrats and directly increased the President’s power over policy implementation. The Executive Reorganization failed largely due to the Watergate scandal. It’s very likely that much of Nixon’s plan to weaken the federal bureaucracy and fundamentally reform the federal government was driven by his own distrust of the “Establishment.” That does not, however, detract from the very real fact that the U.S. federal government of 1968, after almost three-and-a-half decades of near-continuous expansion, was cumbersome, overbearing, and inefficient at fulfilling the tasks assigned it by the American people. Much of this dysfunction, it could be argued, lay in the fact that the federal bureaucracy was becoming an interest group committed to its own perpetuation and loathe to undergo reforms imposed from the outside. Nixon’s plans to lessen the federal bureaucracy’s authority, responsibility, and power, whatever their fundamental motive, bore much potential to transform the federal government from a hulking behemoth into a sleeker, more responsive, and fundamentally more effective machine attuned to the needs of the last few decades of the 20th Century. Had the Family Assistance Plan, Revenue Sharing and policy decentralization, and the Executive Reorganization passed, the apparatus of the federal government might well look different today. Agencies and departments would be more goal-oriented than constituency-oriented; many federal services would be outsourced to newly-vibrant state and local governing entities; the welfare system would be entirely transformed into a payments system rather than a services system. President Nixon’s legacy as a good-government reformer ought to be examined more closely, both for its own sake, and for the sake of better informing government reform efforts in the 21st Century. There is potentially much we could learn from many of Nixon’s initiatives.